This week we’ve examined how online retailers can leverage Facebook Connect, and best practices for doing so. I’ve come across another interesting implementation of Facebook Connect. 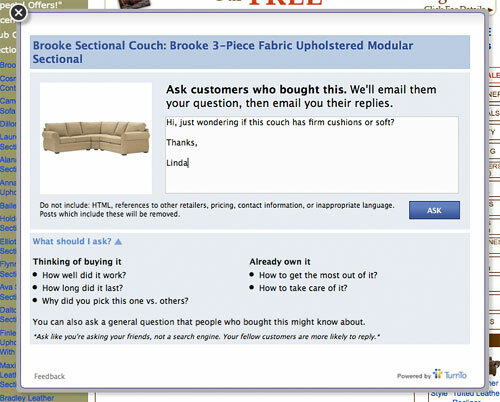 Using technology from TurnTo, ClubFurniture uses it as a means to ask questions from actual buyers of a product. 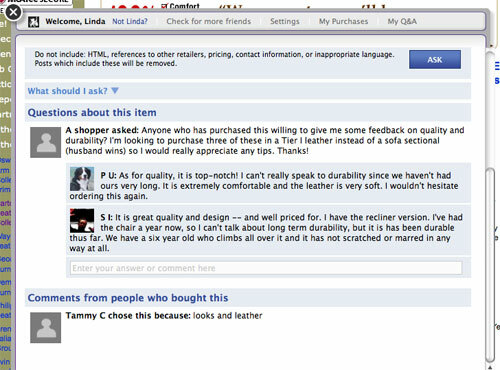 Though ClubFurniture.com is a smaller store, it’s managed to attract engagement for many products. What makes this different than other ask n’ answer tools found on ecommerce sites is you can request to be notified when you receive an answer. This design is brilliant. By presenting the easy, one click Web 2.0 ways of signing in first, and labeling the clunky, archaic form as such, it visually emphasizes the value prop of connecting – it saves you a whack of time, and makes you one of the cool kids. 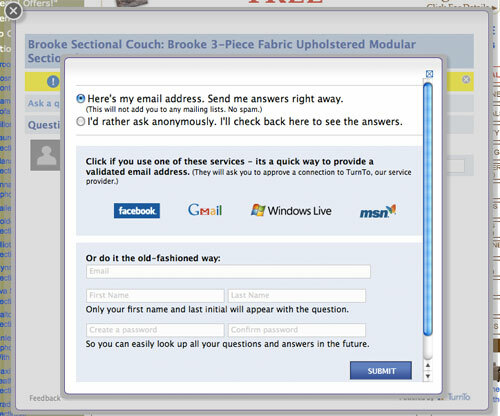 Once you’re signed in (whichever mode you choose), you may ask questions of customers who have bought an item or browse Q&A from other shoppers. There’s a higher level of authenticity when you can demonstrate someone’s a “real person” and a verified buyer. The photo also adds an emotional effect – it feels more like you’re “talking” to someone than when there’s just a thread of text posts. Unlike other Q&A tools I’ve seen, this application will notify you when there is a response – you don’t waste your time checking back when there has been no response, and you don’t miss a response. You can access your Q&A history at any time. Even if you don’t want to use Q&A tools, Facebook Connect (or sign in with Gmail/MSN) could help you attract more customer reviews. It’s a solution to a major point of friction on your site – the required sign up to submit a product review, blog comment, forum contribution or other community activity on your site. While I still believe it’s tough to attract participation with Facebook Connect, the idea of allowing one-click access to features on your site that involve submitting user generated content makes a lot of sense for ecommerce.